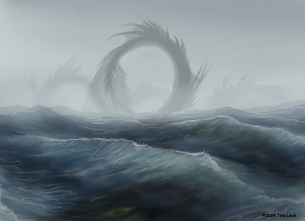 This monstrous sea serpent averages over 200 feet long and 8 tons! Its tactics are very simple- it squeezes the ship until it breaks, and then it feasts on the soft chewy centers thrown into the water. It is exclusive to the Sea of Despair. Stats/abilities known: Nightvision, cold resistant, bite & constriction attacks. Picture from Jaxx Black Fox.